I finished my latest baby quilt. 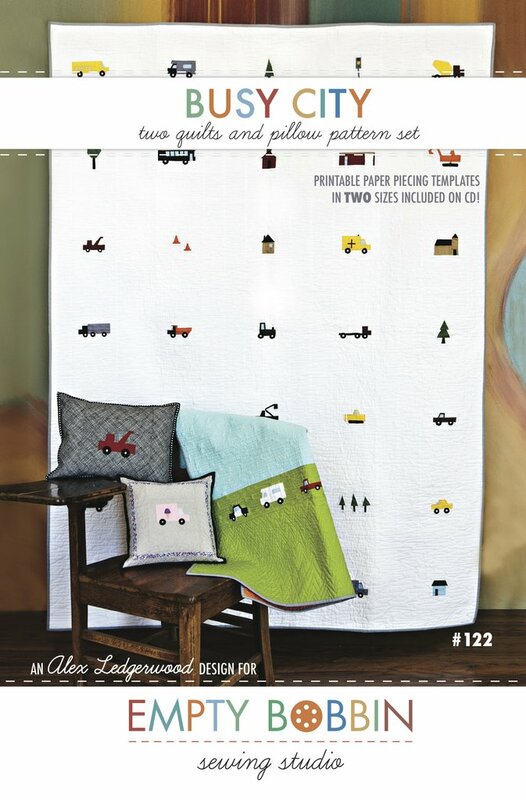 I blogged about the pattern and inpiration earlier. Since there is no recipient in mind, I think I'll put it in my etsy shop. It's hard to part with though, since I just love the fabrics in this one. It was my first time piecing a strip on the back of the quilt. Pretty cute. 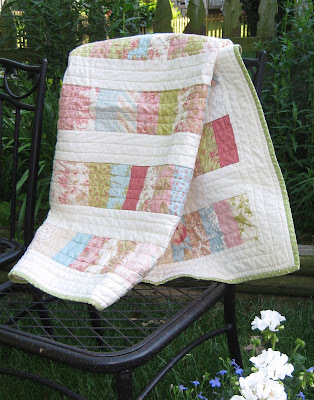 As you can see, I machine quilted it in lines of random widths, and I think it looks so good! This is the first time I didn't prewash all my fabrics, and it turned out great when I washed the finished product - all wrinkley. 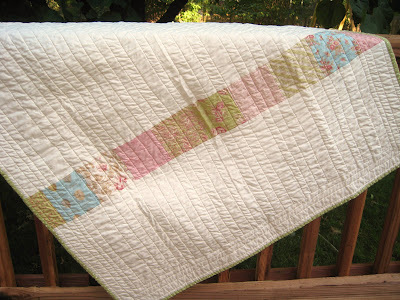 I think it would be a perfect baby quilt, but it would also be nice as a wall hanging. Check out the swell polkadot binding. At his request. I know, I know. The days he asks me to make him something and actually LOVES it are numbered. My little baby is going to turn one next month! 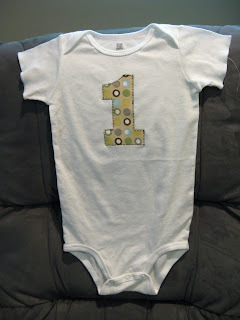 I made this onesie for him to wear on the big day. Now big brother wants one with a three on it :). It will be easy enough to do. Just print out a number in the font of your choice and enlarge it as necessary on a copier. 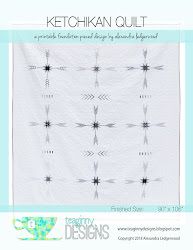 Trace the back of the image (the wrong side so the image will be mirrored) onto fusible web. 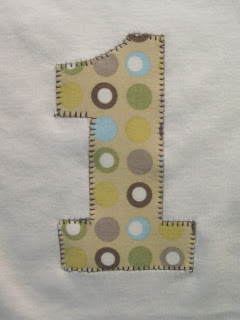 Iron the fusible web onto the wrong side of your fabric, and cut out the number on the lines. 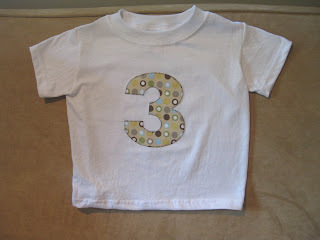 Iron the number onto your shirt, then blanket stitch around the edges. Done! 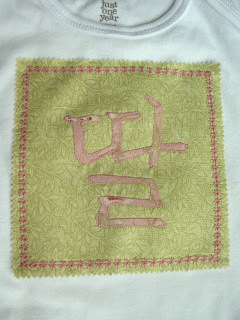 Here is my first attempt at applique of hangul (Korean). This means daughter. I fused the applique then did a small zigzag stictch around it. Not easy given how small these pieces are! It's an 18 month sized onesie. 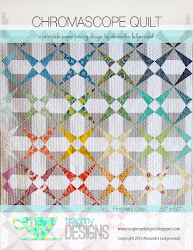 The square is a charm square from Moda's Aviary line I had leftover from my Stacked Coins Quilt. The edges of the square frayed slightly in the first wash, since taking this picture , which I think looks cute!